Happy New Year! I’m trying to start it off with a bang! Dottie Leatherwood got me inspired to do the 30 in 30 challenge and the Strada Easel challenge . 30 in 30 is daily painting for 30 days – starting January 1. The Strada Easel challenge is to do those 30 paintings in 30 days — all from life. So I’m “double-dutying” them. It’s been a really rough Fall. My husband has been in and out of the hospital since mid October, and of course his health is my top priority. But it does mean I haven’t painted as much as I’d like. So I’m hoping this challenge will help me jump start my new year. We still don’t know what going on with him, but while they try and figure it out this will give me some sanity I hope. So this morning I set up in our music room and did this interior. Painting in my pjs! I lit this from above to show you the texture. It’s not as light at the top as it looks here. Here it begins – Day One of Thirty Paintings from Life in Thirty Days. Happy New Year to you all!! 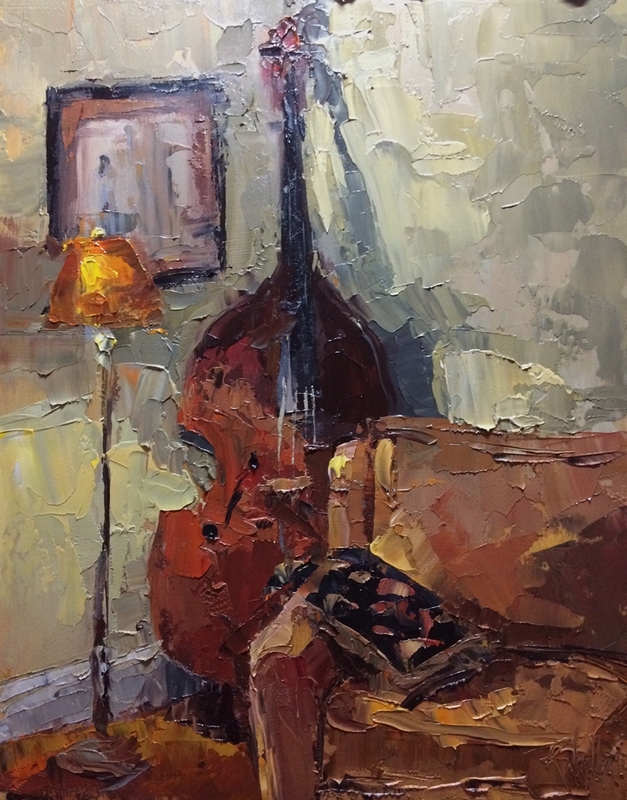 This entry was posted in Uncategorized and tagged 30 in 30, Charlotte nc, daily painting, interior painting, painting from life, palette knife painting, strada easel, upright bass on January 1, 2017 by Robin Wellner. I love your loose, impressionistic brushwork and energy! Beautiful! Thanks so much Tammie!!! Happy New Year!! !